Have you ever knit Brioche Stitch? It’s an interesting technique that involves combining yarnovers and slipped stitches to create a ribbed fabric that is both lofty and warm. 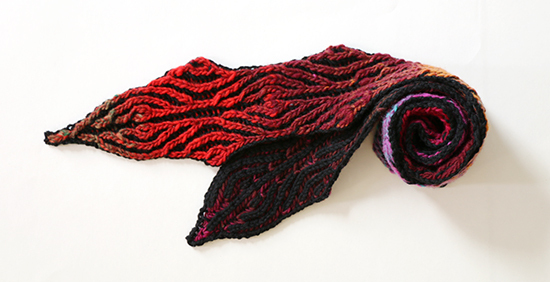 While it’s beautiful when knit in one color, you’ll often see it knit in two colors. This gives the piece a different look on each side with the added bonus that it’s easier to keep track of the stitches while knitting. Many years ago, I attempted some brioche knitting. The instructions weren’t particularly clear for straight knitting, and were downright nonexistent for the increases and decreases. I muddled through a few small projects but my uncertainty about the stitch has made me avoid it ever since. I recently tested a pattern by Kate Atherley for a basic brioche scarf — no increases or decreases. The instructions were clear enough that I felt ready to attempt a more intricate scarf pattern: Omnishambles, also by Kate Atherley. 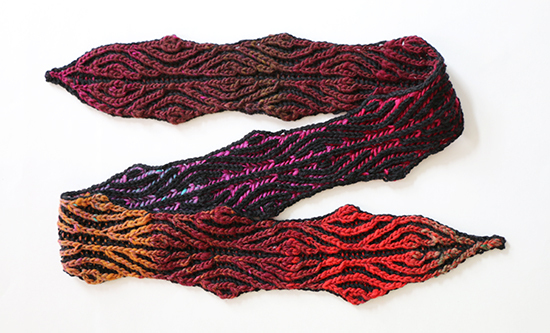 The pattern calls for a half skein of Cascade 220® in black along with a full skein of Noro Kureyon in color #263. I didn’t have anything close to either yarn in my stash; I placed an order for the black Cascade yarn but went with color #399 in the Noro yarn. Side note: Have I mentioned that there are no local yarn shops here? None. This area has the basic big box stores, but no place dedicated to immersing oneself in knitting indulgence. The struggle is real, my friends. The pattern is easy to follow. Between the initial increase and final decrease sections, it’s a simple matter of repeating the same 24 body rows for as long as you wish the scarf to be. I don’t know whether it was intentional, but on my scarf the color changes in the yarn were about the same length as the pattern repeats. There were a few instructions in the decrease section that made me do a double take, but at that point I understood the pattern well enough that I was able to quickly work out what needed to be done. With my one skein of Noro Kureyon, I had just over four yards (almost four meters) of yarn leftover after making the entire scarf with nine body repeats. After blocking, my scarf measures just over four inches (10 cm) wide and about 64 inches (almost 163 cm) long. I’m happy that I decided to give Brioche Stitch another try. Are there any techniques that you’re thinking of giving a second chance? Hello from the Front Porch. I haven't knitted since I was a little girl. Your scarf is amazing. 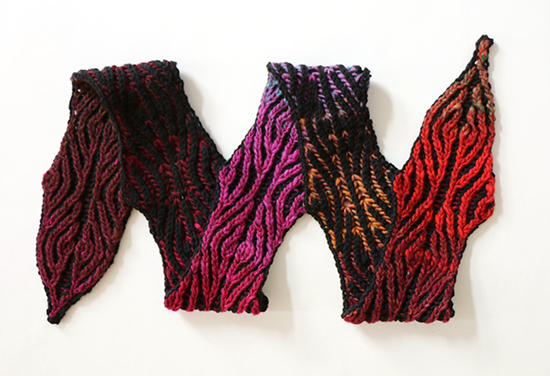 Oh what a gorgeous way to show off all the colour changes in Noro - it looks beautiful! Thank you, Carie! I agree, Kate made great yarn choices when she designed the scarf. Thanks, Julierose. I learned that good instructions make all the difference!